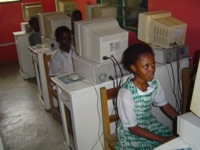 The school has an ultramodern Computer Laboratory and Internet Cafe that serves the needs of it pupils. 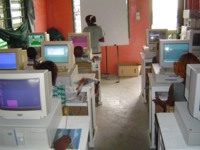 The world is now in the computer age and the pupils of Great Lamptey-Mills Institute can not be left out. The students basically have Computer Studies on their time table (Practically and Theoretically). The courses for the children run from "Introduction to Computers (E.D.P. Concept)", "Introduction to Windows" and most of the basic Microsoft application like "Ms-Word and Ms-Excel". In addition to the above mentioned points, they are also given the opportunity to surf the World Wide Web (W.W.W.) and also access various educative websites at scheduled times.